Scroll down for hundreds of free MP3s, books and videos defending Biblical Reformation worship! "'All worshipping, honoring, or service invented by the brain of man in the religion of God, without His own express commandment, is idolatry.' (John Knox, The Works of John Knox, Vol. 3, p. 34). For Knox and the other reformers, one was not required to construct an image and bow down on hands and knees before it in order to be guilty of idolatry. No, Calvin, Knox, Gillespie, Rutherford, Owen, etc. understood idolatry to be anything that man constructs or invents by his own vain imagination, which is without God's positive sanction, and which is brought into the worship of God. The Regulative Principle of Worship declares that God alone is sovereign in worship. The Regulative Principle of Worship simply applies the principles of Calvinism (i.e. God's sovereign Lordship) to worship, whereas the view that what God doesn't forbid in worship is permitted is applying the principles of Arminianism (i.e. man's sovereign lordship) to worship. Just as fallen man naturally seeks to impose his will in salvation (e.g. "I can cooperate with God in salvation", or "I have a natural freedom to choose Christ"), so fallen man naturally seeks to impose his will in worship ("I can cooperate with God in worship by adding what I desire so long as God doesn't specifically forbid it"). But just as God condemns a man-centered salvation, so God condemns a man-centered worship (Col. 2:23 specifically condemns all will-worship i.e. all worship instituted by man). Self-imposed worship (i.e. any religious act, gesture, symbol, or ceremony in worship) is expressly condemned by Christ and His apostles. It is in fact false worship which no Christian should tolerate in the house of God without a verbal protest to the leadership and separation from this false worship until there is biblical reformation in worship ('The sins forbidden in the second commandment are, all devising, counselling, commanding, using, and any wise approving, any religious worship not instituted by God himself' (The Larger Catechism, Question 109)." - Greg Price, Foundation For Reformation: The Regulative Principle Of Worship, excerpts, emphases added. All the Reformation resources below, by John Owen on worship, are on the Puritan Hard Drive, along with thousands more books, MP3s and videos on classic Puritan and Reformed worship and related subjects. There are also 440 books and MP3s by John Owen on the Puritan Hard Drive! In these two MP3s, John Owen shows the futility of "ceremonies, vestments, gestures, ornaments, musical instruments, altars, images, paintings and bodily veneration," as proceeding from the will of man, and not God, in His own worship! A real spiritual feast defending the Reformation's regulative principle of worship against all Mystery Babylon's inventions in worship. First published anonymously in 1662, this edition is from the mid nineteenth-century printing. This discourse by John Owen contains the judgement of our author in regard to measures which gave rise to the most important events in the ecclesiastical history of England. Owen argues against the liturgy, the imposition of which caused (to the astonishment of the Prelatical hierarchy) nearly two thousand Puritan ministers of the Church of England to resign from their pulpits -- rather than sacrifice a clear conscience concerning the commanded worship of God. These men sacrificed their livelihood, families, and even their own lives rather than offend God by practising the false worship propagated by the idolatrous prelates of their day. In conjunction with this, Girardeau, in his Instrumental Music in the Public Worship of the Church (pp. 24-25) notes, "The words of the great theologian, John Owen 'and the British Isles have produced no greater' are solemn and deserve to be seriously pondered: 'The principle that the church hath power to institute any thing or ceremony belonging to the worship of God, either as to matter or manner, beyond the observance of such circumstances as necessarily attend such ordinances as Christ Himself hath instituted, lies at the bottom of all the horrible superstition and idolatry, of all the confusion, blood, persecution, and wars, that have for so long a season spread themselves over the face of the Christian world.'" Worship is a life and death matter -- eternal life and eternal death, and the regulative principle of worship (as it is based on the second commandment) is ultimately at the heart of any biblically faithful discussion of the questions Owen deals with here. Bannerman concurs (in his two volume set The Church of Christ), when he summarizes this book by Owen as "giving the Scriptural argument against the imposition of liturgies as well as of other humanely devised elements in Divine worship, with great clearness and force" (p. 435). Furthermore, the Westminster Theological Journal (55, 1993, p. 322, 3n) notes, "Owen discusses the true nature of NT worship, especially focusing on the challenge made to it by the Church of England. His discourse regarding the imposition of liturgies is one of the most thorough and forceful arguments for the regulative principle of worship as the only principle which safely guards the Christian conscience from the abuse of church power." All this shows that Owen clearly understood that the regulative principle of worship (sometimes called the Scriptural law of worship) was foundational to all true Reformation. Anyone who publicly opposes the regulative principle of worship is not only an idolater (who encourages others to violate the second commandment), but a deceiver also -- and in some cases, this may be evidence of an unregenerate heart. Moreover, Scripture and history clearly demonstrate that Satan always fights with all his might to overthrow this foundational biblical truth concerning worship. Chapter I. The liberty given by Christ. Chapter II. The institutions of the gospel. Chapter III. The Lord's prayer considered. Chapter IV. The worship of God as conducted by the apostles. Chapter V. The practice in the first three centuries. Chapter VI. Pretended antiquity of liturgies disproved. Chapter VII. Arguments against liturgies. Chapter VIII. The authority imposing liturgies considered. Chapter IX. Liturgies exclude the means appointed by Christ. Chapter X. Other considerations about the imposition of liturgies. "But such is the corrupt nature of man, that there is scarce any thing whereabout men have been more apt to contend with God from the foundation of the world. That their will and wisdom may have a share (some at least) in the ordering of his worship, is that which of all things they seem to desire. Wherefore, to obviate their pride and folly, to his asserting of his own prerogative in this matter, he subjoins severe interdictions against all or any man's interposing therein, so as to take away any thing by him commanded, or to add any thing to what is by him appointed. This also the testimonies recited fully express. The prohibition is plain, "Thou shalt not add to what I have commanded.'" - John Owen, Concerning Liturgies and Their Imposition (emphases added). Instrumental music in public worship was a regulated circumstance of Old Covenant worship and thus Calvin writes, "From this it appears that the Papists, as I shall have occasion to show elsewhere, in employing instrumental music cannot be said so much to imitate the practice of God's ancient people as to ape it in a senseless and absurd manner, exhibiting a silly delight in that worship of the Old Testament which was figurative and terminated with the gospel." Martin Luther also wrote, "The organ in the worship is the insignia of Baal! The Roman Catholics borrowed it from the Jews." You may be shocked to see the strong and unanimous testimony, given by many famous and much respected Protestant Reformers, against the use of musical instruments in the public worship of the one true and living God, found in these MP3s. Moreover, in these MP3s, you will see how clear it was that these Reformers knew that using musical instruments in public worship, after the first coming of the Lord Jesus Christ, was to deny (whether by teaching or practice) Christ's work. It has been said that we should no more use musical instruments in the public worship of God (after Christ's first coming), than we should take a lamb to the front of the church during public worship, to sacrifice it, as if the Lord's coming, and the greater gospel light He brought, had not done away with such shadows of the old administration of the one covenant of grace -- or, as John Calvin so aptly wrote about the Papist of his day, that in using musical instruments in the public worship of God they exhibit "a silly delight in that worship of the Old Testament which was figurative and terminated with the gospel." Has Rome's false worship entered your church is this area, contrary to the teaching of the Bible, the Apostles and the best Puritans and Reformers throughout history? If so, these three MP3s are "must listening" material! This sermons defends the Biblical (Reformation, Puritan, Covenanter) regulative principle of worship from the New Testament. It also exposes Arminianism in worship (or will-worship). John Calvin wrote, "If it be asked, then, by what things chiefly the Christian religion has a standing amongst us, and maintains its truth, it will be found that the following two not only occupy the principal place, but comprehend under them all the other parts, and consequently the whole substance of Christianity, viz., a knowledge first, of the right way to worship God; and secondly of the source from which salvation is to be sought. When these are kept out of view, though we may glory in the name of Christians, our profession is empty and vain." (Cited in, Carlos, Eire, War against the Idols: The Reformation of Worship from Erasmus to Calvin, p. 198, citing from John Calvin's On the Necessity of Reforming the Church, which is free online at http://www.swrb.com/newslett/actualnls/NRC_ch00.htm.). Regarding John Calvin's On the Necessity of Reforming the Church Carlos Eire, in War Against the Idols, notes, "Calvin speaks about the nature of worship and about the seriousness of the sin of idolatry in his 1543 treatise, On the Necessity of Reforming the Church, where he concentrates on the significance of worship for the Christian religion. Calvin's argument, as indicated by the title of the treatise, is that the Church had reached such a corrupt state that its reform could wait no longer. The most significant aspect of corruption singled out by Calvin is the perversion of worship, and it is in explaining this issue that he set forth the basis for his attack on idolatry. Calvin begins by studying the place that worship holds in the Christian faith, and he concludes that it is one of the two elements that define Christianity..."
"The Regulative Principle of Worship is God's ordained law for worship. "A law for worship?" someone might ask. "That sounds rather legalistic. I think we should be free in our worship of God -- we should be led by the Spirit." However, that person or that church that follows such "a rule of the Spirit" has in reality established his or their own law for worship just as much as the one who follows the Regulative Principle of Worship. You see there is no neutrality in the way in which we approach God in worship. Either we approach the living God according to His revealed Word (i.e. the Regulative Principle of Worship), or we approach Him according to our revealed word. Someone's word is going to expressly guide us in worship. The only question is, whose word will guide us? God's or man's? Regardless of the reason given (whether to be free in worship, or whether to be led of the Spirit, or whether to attract more people, or whether to make people feel good, or whether to help people to know and feel the presence of God), and regardless of the motive in introducing the man-made tradition (whether sincerity, or whether joy, or whether supposed faith and love), any act of worship not instituted by God in His Word is instituted by man's authority and therefore usurps Christ's authority in His church. A search, using the Master Search Index, on the Puritan Hard Drive, for the word "worship" produces 92,262 results in 1,399 books. A search "regulative principle" using the Master Search Index on the Puritan Hard Drive returns 1,444 results in 69 books. All these results, for both these searches (or any Master Search Index search) are also shown in the context of one line and with one click, on any of these lines, you are taken to the right book, on the right page, with your search term highlighted. There are 630 Reformation resources (books, videos and MP3s) by the modern-day Puritan Greg Price on the Puritan Hard Drive. Corrupt Worship & God's Anger With the Church and the Nations by Greg Price (Free MP3) Make sure to listen to the very end, as the last portion is, in many ways, is the most important, as it demonstrates the serious consequences to churches and nations when idolatry is taught and practiced. The rest of Greg Price's Micah series (23 free MP3s) is at http://www.sermonaudio.com/go/58657. There 547 Reformation resources, under the category "Reformed Worship, The Regulative Principle, etc. ", on the Puritan Hard Drive. There are 261 Reformation resources, on the Puritan Hard Drive, with the word "worship" in the title. "The Puritan Hard Drive is an exquisite piece of work.The purchaser of this fine product will have at his fingertips more of the best Reformed literature than he can probably ever get around to reading. 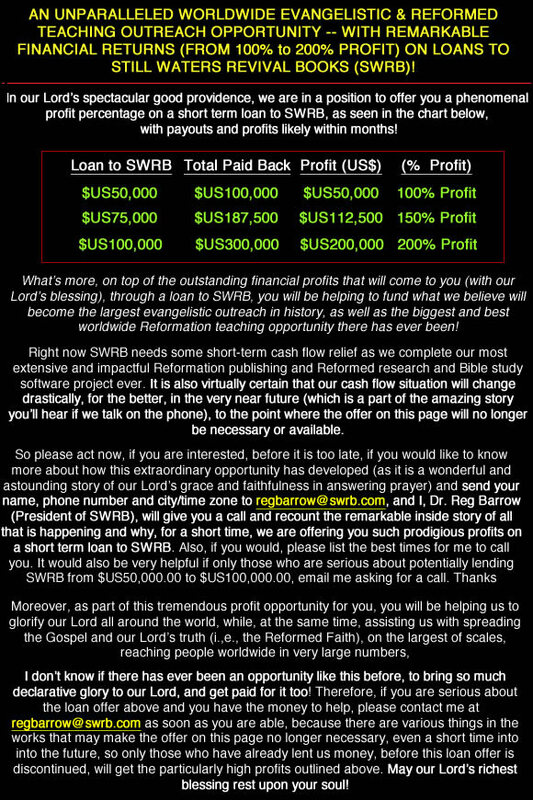 Truly, if a Christian wants to invest wisely in his own growth, this is the best investment he can make at this time. More than highly recommended!